In the continuing escalation in his attack on Amazon, President Donald Trump issued an executive order yesterday for the establishment of a federal task force, led by Treasury Secretary Steven Mnuchin or his designee, to investigate the finances of the U.S. Postal Service (USPS), which has lost more than $65 billion during the past 11 consecutive fiscal years. The special commission is expected to submit a report on its findings and recommendations within 120 days. "It shall be the policy of my administration that the United States postal system operate under a sustainable business model to provide necessary mail services to citizens and businesses, and to compete fairly in commercial markets," Trump wrote in the executive order. "The USPS is on an unsustainable financial path and must be restructured to prevent a taxpayer-funded bailout.” The executive order calls for an examination of USPS policies, pricing and workforce costs, and will recommend reforms. 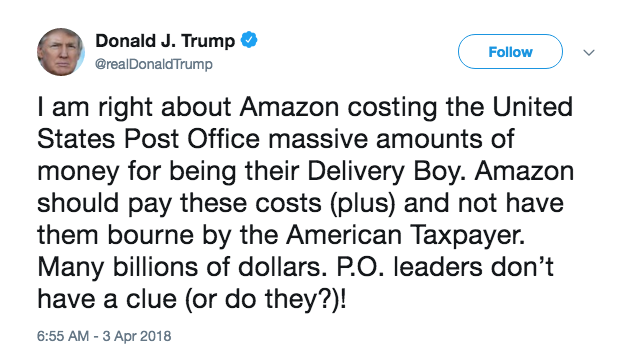 Trump has indicated that Amazon will have to pay a fair rate, which he says is more than what the USPS is currently receiving. How this will be achieved is unclear, however, given that the Postal Regulatory Commission (PRC) is largely in charge of determining postal rates for the USPS, an independent organization. While the terms of the contract remain confidential, the Postal Service has indicated that the pact with Amazon is profitable and points out that it's legally prohibited from delivering packages at rates below its delivery costs. In fact, the USPS has indicated that the addition of package delivery services has been one of the few bright spots in its otherwise bleak financial performance, generating double-digit revenue increases. The USPS actually set a record on Dec. 18, 2017, when more than 37 million packages were delivered - the most packages delivered in a single day in its more than 200-year history. The Senate bill would also create a new Postal Service Health Benefits Program (PSHBP) within the Federal Employee and Retiree Health Benefits Program (FEHBP), implemented and administered by the U.S. Office of Personnel Management (OPM), for all postal employees and annuity retiree recipients and require all Medicare-eligible postal annuitants and employees enrolled in the PSHBP to also enroll in Medicare, including parts A, B and D.
A similar bill that was presented earlier in the U.S. House of Representatives, called the Postal Reform Act of 2017, HR 756, has also received bipartisan congressional support.